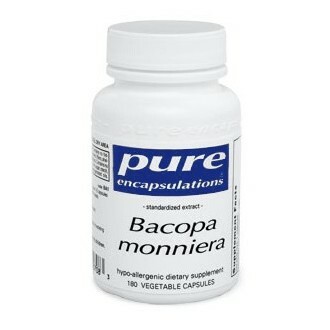 Ayurvedic medicine has utilized Bacopa monniera traditionally for centuries to support the nervous system, enhance cognitive capacity, and sharpen memory. Over the last thirty years, preliminary clinical trials have suggested encouraging results. A three- month trial conducted by Australian scientists suggests that bacopa may support learning, moderate stress, and promote memory. An animal study suggests the potential for bacopa to support mental function under stress. In a double-blind, randomized, placebo- controlled investigation, bacopa supported memory retention in adult subjects. The effects of this extract may, in part, be explained by antioxidant protection of important processing centers in the brain, including the frontal cortex, striatum and hippocampus. Bacopa may also help to promote healthy synaptic activity and neurotransmission in the brain. 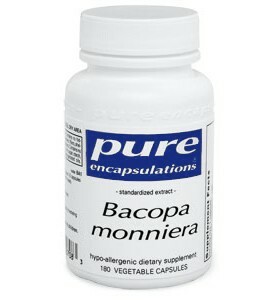 Bacopa monniera is a prized Ayurvedic herb supporting mental acuity, memory, relaxation and cognitive function under stress.